The transition into motherhood was tougher than I thought it would be. While I do not believe that I had postpartum depression, I definitely suffered from the baby blues in some respect. I knew that life would change when the twins arrived, but nothing could have prepared me for the gravity of the change. I spent the first couple of months in survival mode, learning the ropes of parenting. Self-care wasn't even on my radar. There wasn't time for me, when two babies required my attention 24/7. I survived on adrenaline for a while, wanting to be supermom, but knew in the back of my mind that I'd eventually burnout. Funny enough, when I did burnout, I didn't learn my lesson. I put on a few bandaids and jumped back on my wobbly parenting bicycle. When I finally (sort of) learned, I would feel guilty whenever I did anything for myself. I wouldn't feel recharged and relaxed at the end of my 'me time.' In a way, it was pointless. 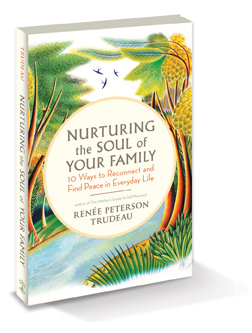 When I was contacted a couple of months ago to read Renée Trudeau's book Nurturing the Soul of Your Family, I immediately said yes. "Self-care is not about self-indulgence, it is about self-preservation." One simple sentence that has changed my outlook on 'me time' and is helping me drop the feelings of guilt (hey, it's a work in progress!). Renée goes on to talk about the direct connection between our emotional and mental well-being and our relationships with our spouse, children and friends. Since reading this book, I have reminded myself almost daily that unless I take care of myself, I am no good for anyone else. Self-care is not about 'massages and pedicures', Renée says. Self-care is about tuning into your physical, emotional, mental and spiritual needs. It can be as simple as taking a 15 minute walk in the park or having a heart-to-heart conversation with a close friend. For me, it is also sitting down to write. I've realized recently how these small things nurture and feed my soul. My gut told me that I needed to read this book. When the book arrived, within minutes, I was hooked. As a parent, it is clear that Renée understands the challenges of balancing work, life, relationships and children. She talked to many parents while writing this book and quotes several of them throughout. Alyson, a mother of three, wrote, "Realizing that sometimes we needed togetherness and sometimes separateness changed our lives. Tuning in to what's needed individually and collectively for our family helped us all feel happier and more free." I liked this quote because there are always going to be reasons why we can't take care of ourselves, just like there are always reasons why we can't get to the gym or eat healthier. If the entire family tunes into their own needs, we can all hold one another accountable. At the end of each chapter, Renée provides practical exercises for readers. She starts out each exercise by asking readers what they're doing well (a 'pat on the back'). For me, this is a great way to start my reflection since I can be quite critical of myself. She then provides valuable tips and questions to help readers 'put it into practice.' This is followed by journaling exercise to 'imagine a new way of being.' These exercises' have forced me to be present when I'm reading, instead of in a million different places like I usually am. This book couldn't have come at a more perfect time for me. While reading, Renée gently reminded me to not only make time for self-care but also be kind and compassionate to myself. She is realistic and practical, having been through some of the same struggles that millions of other moms have faced. Regardless of what your current work, life, family or individual goals may be, Nurturing the Soul of Your Family is a must read. ** Nurturing the Soul of Your Family can be ordered here. ** More information on Renée Trudeau can be found here. Disclaimer: This book was given to me by the publisher, New World Library. The opinions in this review are entirely my own. I have received no compensation for writing this review. I can't say that I feel guilty for taking care of myself. I wish several people would take care of me too. ;-) but this book sounds like a must read. You've got a few years on me in the parenting department. Hopefully my guilt will completely subside soon! Thanks for this awesome review. A must read for sure...I haven't really had much "me" time yet and Evie is 2 months old on Monday! I had sitters for her (friends) last weekend and thought about her the entire time I was away from her...I need a lesson in self-care, for sure. I'm going to get this book!